/ IT empowered: 3 ways to bring people and technology together. IT teams have no shortage of work to do. In fact, the role of IT is expanding: more and more data comes pouring in from every department in the company, and IT departments are being asked to keep up with the demand. The problem is, this influx in IT workload isn’t always the kind of work that will fully utilize their abilities and make an impact on business performance. So as an IT leader, how do you empower your team to get out of the weeds of reporting, and start delivering data in a way that drives action? 1. Deliver relevant data, when and where it’s needed. IT has the data. That’s why they’re hit up day and night for reports. IT specialists need the ability to zoom in on the data that matters right now, and get it to the people who need it while it’s still relevant. 2. Tailor the experience to meet everyone’s needs. Not everyone in your company is a techie—in fact, most aren’t. Throwing last quarter’s marketing data in a monster spreadsheet won’t help teams identify key trends, let alone make decisions. 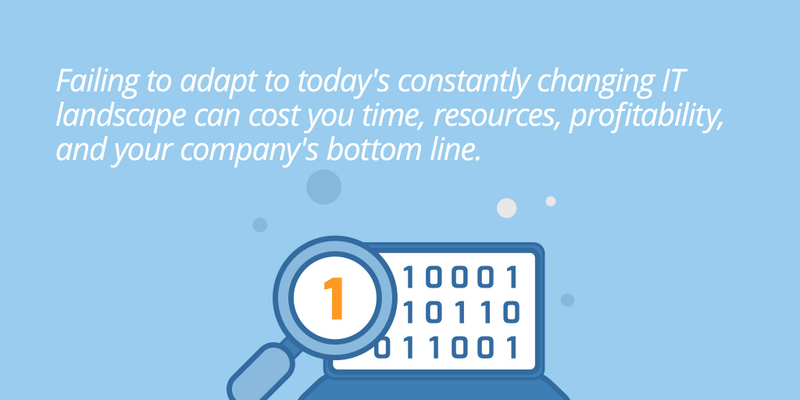 The ability to provide digestible data changes all of that. 3. Collaborate in real time to make better decisions, faster. Sometimes it seems like data falls into a black hole. It’s there, but nobody’s talking about it. Getting teams to talk about the data is the fastest, surest road to real data analysis and decision-making. Real-time discussions, centered around real-time data, change the way everyone does business, starting with IT. Learn more about how IT leaders can break out of business as usual—and how Domo can help them bridge the gap between people and technology.